米澤穂信 (YONEZAWA Honobu, born 1978) is probably best known outside Japan for a series of everyday life mysteries, starting with 氷菓 (hyouka, Ice cream, 2001), which were the basis for an anime series of the same name. I've only seen the anime series of this; but judging from that 春期限定いちごタルト事件 (shunkigentei ichigotarto jiken, The Spring Term Special Strawberry Tart Case, 2004) is very similar. 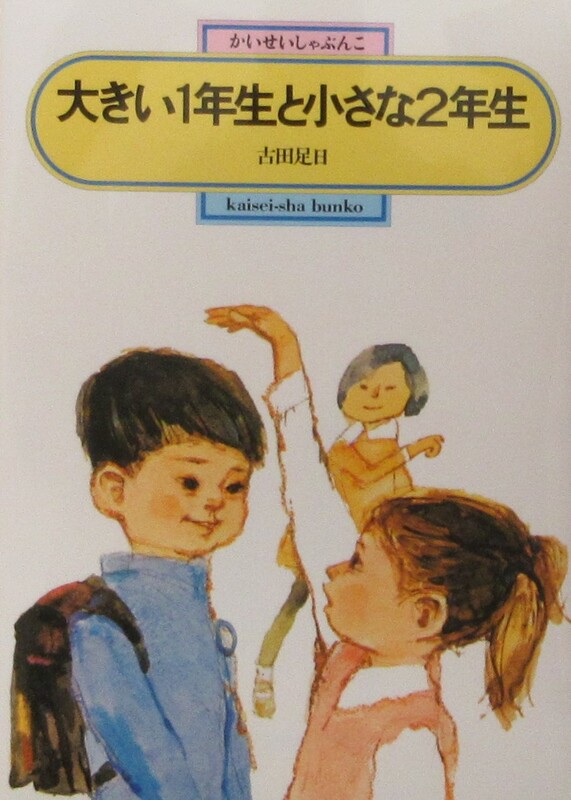 This book is also a series of "puzzles of everyday life", solved by a boy and girl who have just started high school (which in Japan would make them probably fifteen years olds´): the teenage narrator, 小鳩 常悟朗 (KOBATO Jougorou) and his friend 小佐内 ゆき (OSANAI Yuki). Kobato and Osanai were at middle school together, and various unfortunate experiences there have led them to adopt a life philosophy, which they describe to themselves as aiming to become a perfect 'petit bourgeois'. In practice this means keeping their heads down and not doing things that might attract attention. In particular, Kobato tries to avoid showing off his skill at deduction. Osanai behaves like a reserved and timid child, very dependent on Kobato and only showing enthusiasm for desserts. What part of her character she is suppressing only becomes evident in the course of the book. The 'life philosophy' will probably make older readers roll their eyes a little; but you could say it is a realistic reflection of the things teenagers do. The stories are all mysteries, but they make a comedy of school life. Kobato comes across as a somewhat intellectual type, at any rate a student who reads a lot and pays attention in class. This occasionally makes the Japanese a little more difficult than you might expect for a reader who doesn't come equipped with this standard knowledge. There is a certain tendency to melancholy in the stories, a suggestion that the main characters are suppressing part of their own nature; but comedy is prevalent. Despite the reliance on certain "types" from popular literature, this is generally pretty successful. Kobato of course does not manage to avoid getting involved in mysteries, and throughout the book he solves a series of mostly minor puzzles, often pulled into them by a busybody friend from his primary school days. Some involve a real (mostly very minor) crime but others are merely puzzles. Most notable is a chapter devoted to finding out how someone managed to make cocoa using only three mugs and one teaspoon (but no milk pan), which is played as a kind of 'impossible crime' type puzzle. As with many such short story collections in Japan, there are developments over the course of the book, a gradual revelation of Kobato and Osanai's characters and background, and an overarching mystery which comes to a high point in the final chapter. The mystery aspect is generally good enough. Although nothing stands out as a classic puzzle, the surprise for the reader at seeing where the carefully laid preparation is leading is real. And the mix of school comedy and mystery allows for some pleasing humour about what constitutes a reasonable deduction. The book is the first in a series of three (one for each term of the Japanese school year). I owe my awareness of it to Ho-Ling's blog. You can read his review there, as well as a review of the second book in the series (which I haven't yet read). The title of the short story collection なんでも屋大蔵でございます (nandemoya Daizou degoizaimasu, It's Daizou the Odd Jobs Man, 1985) by OKAJIMA Futari (岡嶋二人) is a bit hard to translate. The job description more or less literally translates as "anything man", so that "odd jobs man" sounds about right. The synonymous 便利屋 (benriya) translates literally as "handyman", which is much the same idea. This sounds like someone you might employ for repairs that don't quite need a proper specialist. The Japanese version seems to include work of this kind, but it is not limited to it. "Anything" can literally be anything. Only the hero of this collection, KUGIMARU Daizou (釘丸大蔵) draws the line at anything criminal or obviously immoral. Even so, by some odd chance, his work keeps bringing him into contact with a variety of mysteries. Daizou is middle aged, but in manners more like an old man, with a tendency to a modest formal turn of phrase and a fondness for digressing with conventional observations on morality (which combine, surprisingly or not, with good natured kindness in his actual actions). His office is a converted shed and for most jobs his transport is a bicycle. Despite his humble appearance and manner, he has quite sharp wits. In "Murder in the moment of infidelity", a client Daizou had previously refused comes to him with a new request. She had wanted him to tail her businessman husband to catch him in the infidelity she was sure he was guilty of. The private detective she employed instead had delivered a report that showed no sign of any infidelity; but a little later the police come to her saying that they had found the detective dead near her house from a road accident. He had had the report in an envelope, apparently to deliver to her. So they hand it to her. In her confusion she does not tell them that she had already received the report. Apparently the detective had broken into her house to steal it. What was in the report to make him want to take it back? "Snow White has been kidnapped" starts with a phone call asking Daizou to kidnap the favourite white cat of the local cat lady. Daizou refuses, but by the time he gets round to visiting the cat's owner, the cat has been stolen and tthe kidnapper has sent a cryptic letter giving a clue to where the cat is now. "Punk rock Awa odori" starts with a visit from a young man who is uncertain whether he is speaking to Kugimaru Daizou or is himself Kugimaru Daizou. He had woken a little earlier lying on a path with no memory of who he was. After a passer by steals his wallet, the only clue he has to his identity is Daizou's business card in his back pocket. The cards are new and Daizou had handed out only a few of them, and definitely none to this young man. In "Tailed, Killed", Daizou is on his way to a salaryman's apartment to feed his pet squirrel while he is on a business trip. On the way he notices that he is being clumsily followed by a young man. He easily loses his pursuer, but feels that after all the effort he has put in, he should not disappoint him to heavily. Instead he waits to confront him, but when no pursuer appears, he retraces his steps and finds the man lying murdered in the road. In "Where are you off to in such a hurry?" the imperious wife of the owner of a cleaning service calls Daizou out peremptorily as an urgently needed stand in. When he gets there, she complains about the time he had taken and rushes out without explaining what she had called him to do. Her husband, who is left behind with Daizou says with resigned amusement that he does not know either, but they were to wait by the pond at the back of the business. A little later a car drives up there. The figure that gets out dumps a large cardboard drum in the pond and drives off to the indignation of the husband. Apparently the pond is constantly used as an illegal dumping ground, which he and his staff regularly clean each week. When the wife does not appear, the husband pays Daizou for his wasted time. But a few days later Daizou gets a visit from the police. The team of rubbish cleaners tidying the pond have found in the dumped cardboard tube the dead body of the missing wife. I don't want to praise the mysteries too highly. An experienced reader will probably see through most of them, at least in part. Most do have some new trick to them, even if that is often a variation on familiar old tricks. There is more attention to character (including Daizou's character, both as actor and as narrator) and to non-mystery narrative elements. The style is light and humorous, much more so than in other Okajima Futari books that I have read; two of the stories even get by without a murder. Even without any really stand out mysteries, I thought the collection worked very well. The stories apparently provided the basis for a Japanese television series, 何でも屋大蔵の事件簿, The Casebook of Daizou the Odd Job Man, in 2002 and 2003. 体育館の殺人 (taiikukan no satsujin, The Gymnasium Murder, 2012) is a mystery novel by AOSAKI Yuugo (青崎有吾, born 1991). The publishers, Sougen Suiri, often have an invented English title on their cover, and in this case it is The Black Umbrella Mystery, which might suggest some similarity to the first Ellery Queen mysteries, such as The Roman Hat Mystery. If that was what they wanted to suggest, the suggestion is certainly warranted. Although the book is a locked room mystery, the style of detection involves a string of deductions around a single object, leading to criteria that narrow the field of suspects, very much in the style of The Dutch Shoe Mystery and particularly The Roman Hat Mystery. The table tennis club and other sports clubs are using the old gymnasium of their high school. At one end of the hall is a stage, and unusually its curtain is down. When the theatre club arrives for its rehearsal they open the curtain. On the stage is the body of the president of the broadcasting club, stabbed in the back. The investigating police soon stumble on a puzzle: the doors at the stage end were both locked, so that the only exit was through the hall; but the president of the table tennis club claims that nobody had come through from the stage end since the victim entered. Since she had been alone in the gym for part of this time, they soon decide that she must be the killer. High school first year, 柚乃 (Yuno), who overhears their discussion, is convinced that her club president is innocent, and desperately seeks the help of secretive and eccentric schoolboy genius 裏染天馬 (URAZOME Tenma). She finds him in an unused club room, which he has turned into his own apartment and filled with toy figures of anime heroines. Urazome has no interest in school work or anything else except for anime and manga, to which he devotes all his time and money. I get the impression that the target audience for this book is young teenagers who have not yet read much mystery fiction. Except for one meta-literary joke about 'fair play', all the cultural references seem to be to anime and manga. Most of these escaped me; but I didn't get the impression I was missing anything of value. They seemed simply part of the thin characterisation of Urazome as an otaku. The emphasis on Urazome's effortless intellectual superiority is another element that reads like something only a book for children would do. Although the 'fair play' joke I mentioned touches on what some might consider improper misdirection, the mystery is very much fair play. All the elements needed to solve the mystery are presented openly and in many cases their significance is noted in advance of the final explanation. I'm not quite sure how good the reasoning is. There were points in the series of deductions where I thought that obvious alternatives were being missed, while a lot of time was being spent on ruling out possibilities that weren't very likely in the first place; but that's a criticism it probably shares with Ellery Queen's acknowledged classics. I didn't enjoy the deductions here as much as I enjoyed Ellery Queen. I'm not sure if that's because I actually was a teenager when I read Ellery Queen or because there was something slightly lacking here. It felt a little like we were creating Venn diagrams more than reading a story. In Ellery Queen the deductions often lead to a real surprise, and perhaps that was what was missing. The school setting felt like a deliberate reversal on the kinds of unusual setting favoured by Ellery Queen and others: a completely mundane world, in which every object, room and role is something everyone is familiar with. A few characters are more like types from popular literature than real people; but the only bit that was really far from everyday life was Urazome. I did slightly feel that a sharper observation of the everyday world might have made even that a bit more interesting. This sounds a bit negative; but if you like classic puzzle detective stories, this is certainly one to try. I certainly expect I'll try another one in the series at some time. One point I liked was the confidence shown in giving us a full length novel with only one murder. Many writers, including the most famous, almost feel obliged to have at least two (Sayers and Crofts are the exceptions that spring to mind); but there is something pleasing to me when the whole book is about just one crime. You can read a different take on the same book at Ho-Ling's blog here. 大きい1年生と 小さな2年生 (ookii ichinensei to chiisana ninensei, A Big 1st Year and a Little 2nd Year, 1970) is a children's book by FURUTA Taruhi (古田足日, 1927-2014). The title characters are in their first and second years of elementary school (小学校, shougakkou), so probably six and seven years old respectively. The book too is clearly aimed at relatively young readers. Akiyo and Mariko are the two smallest children in the second year, small enough to be mistaken for kindergarten children; and of the two Akiyo is just slightly smaller. She had somehow had the idea that, since second years are taller than first years, she would get taller at the start of the new school year (which is also the start of the book). For all her small stature, she is tough and self confident, not shy of quarrels with other children. Her friend Mariko, by contrast, is quiet, calm and a little detached. Masaya, a new first year, whose family has just moved to a house near Akiyo's, is large enough that people sometimes think he is a third year; but his character is the exact opposite to Akiyo's, anxious to the point of cowardice. The elementary school that Masaya and Akiyo walked to was on top of a hill. There were apartment blocks on the high ground. Akiyo's friend, Mariko Fujioka, lived in one of them. The school was just beyond the apartment blocks. From Masaya's house to the school and the apartment blocks, there were two routes. One was a broad road up the hill, with lots of traffic. The other, the one that Masaya was now walking, was a narrow path up between two cliff faces. 'No. I don't want to go that way,' Masaya said to his mother with a scared face. Mother gripped Masaya's hand tightly and pulled him along. Masaya was dragged along, almost crying. That was why Masaya was walking along the cliff route; but he was clinging tightly to his mother, because it was so scary. It wasn't just narrow, it was dark and there were steep cliffs of red earth on either side, topped with thick woods. In the midst of those woods, there were huge pine trees that you could see from Masaya's house, and in their tops crows would call, 'Caw, caw' from time to time. Akiyo quarrels with Masaya on their first meeting, but they soon become more friendly; and Masaya comes to depend on the fearless Akiyo a little too much. Worried about losing her friendship, he starts to consider how he can become braver. This a simple story of real life, narrated in a simple style for young children. For all its simplicity, I think it does a very good job of depicting the friendship at the heart of the story, and also in communicating a sense of place, in this country district on the outskirts of Tokyo. And although the events that make up the plot are never far from the minor incidents that make up normal life, the story's progress still feels very satisfactory. After deciding to return to blogging, but only for books for which I feel some enthusiasm, my first review goes against that decision. It's a solid but unremarkable collection of short stories, by TAKAGI Akimitsu (高木 彬光), 最後の自白 (saigo no jihaku, The Last Confession, 1967). Takagi was one of the major post war writers of traditional puzzle mysteries, with some classics to his name, especially in his earlier works. There are six long short stories in this collection, all featuring public prosecutor, 近松茂道 (CHIKAMATSU Shigemichi). Chikamatsu is one of the prolific Takagi's many detectives (he is not even the only prosecutor detective). As a prosecutor, he is involved in the case, but only at a later stage. Most of the investigation is done by the police, who report to Chikamatsu and take advice from him. A common pattern is for the police to fix on one suspect, but find Chikamatsu unwilling to prosecute without further investigation. Each story has a different investigating policeman. At least, they have different names. If there is any difference of character, it is hard to detect, except that some stories demand that the policeman be a little more stubborn and obtuse than the average. All the stories are traditional mysteries, with attempts at misdirection and alibi tricks, some moves towards impossible crimes, though nothing that fully qualifies as such. Two feature a floor plan. Most have a second murder. The stories generally aim for a little originality in the framing to catch the reader's interest, but most still feel a little bit routine. The same goes for the puzzle element. For the most part the likely reaction to the revealed solution is 'Okay, fair enough' (except for couple where most readers would probably wonder how the killer could pick such an improbable approach to their problem). パイプの首 (paipu no kubi 'The Pipebowl'). Two policeman notice a parked car on a lonely mountain road as they drive past on a different errand. Seeing it still there as they drive back hours later they investigate and find that there is a corpse a the bottom of the roadside cliff, the brother of an importer of French luxury products. When a secretary in the same firm is murdered, the bowl of a pipe is found lying next to her dead body. 影の男 (kage no otoko 'The Man in the Shadows') A wealthy man's family is gathered for his last hours. Moments before his death, one of his managers rushes in with news that the eldest son has been murdered. 愛と死 のたわむれ (ai to shi no tawamure 'The Play of Love and Death'). Police suspicions soon fasten on the wife of a murdered man; but Chikamatsu is cautious. かみきりの情熱 (kamakiri no jounetsu 'The Passion of the Mantis'): an inverted mystery. A woman has an almost foolproof plan for the murder of the lover who rejected her. 消えた死体 (kieta shitai 'The Missing Corpse'). Late at night a constable is called out from his kouban by a man claiming to have seen a murder in a different apartment in the building where he lives. But although the man had set other residents to watch the door, when they enter they find an undisturbed room with no corpse and no sign of a struggle. The constable remembers that the day is April 1 and decides that this is a joke; but later that night, the man who lives in the apartment rushes in to say he has found the body of a murdered woman there. 最後の自白 (saigo no jihaku 'The Last Confession'). When a blackmailer is killed, three people each claim to be the murderer. Which is the real killer, or is it someone else entirely? If you look through the list of blogs at Ho-Ling's blog, you will probably notice that most of the few English language blogs on Japanese crime fiction have one by one stopped posting. This is not (I hope) a case of a serial killer targetting English language crime fiction bloggers. My own absence has been due to various reasons, such as work and lack of enthusiasm for sitting in front of a computer in my free time. I have been reading Japanese books, but some mysteries and children's books (the main content on this blog) disappointed me, so that I wasn't keen to review them. I've been reading more literary books recently, which don't need a review from me, as there are doubtless plenty of scholars writing about them. I still read some crime fiction and children's books though, and there are a few books I'd like to write about. I expect to start posting again, but with much less frequency than before. The mystery starts with the murder or perhaps suicide of the secretary of the politician involved in the corruption scandal, then shifts to a traditional drama surrounding machinations within a wealthy rural family whose patriarch is lying on his death bed. As the death toll rises we wonder how the two stories fit together. The answer (SPOILERS, I suppose) is that they don't; and the original mystery is basically dropped in place of another one. My memory of the few Uchida books that I've read is that they do occasionally have an interesting idea somewhere in them, although swamped by the lukewarm soup of platitudes that serves as fodder for mid evening television drama. In this case, anything promising in the story leads only to disappointment. On their way to their holiday in Kyūshū, the Izumis are suddenly summoned by the train conductor to come and look after their child. When they find the conductor, he is with an unknown boy, six years old, who has a letter asking them to accompany him to Yufuin (an peaceful onsen town in Ōita). Who is the boy and why has his mother taken such a strange method to send him to this distant town? The answers prove to be both implausible and uninteresting. The mysteries of the actual murders are poorly supplied with clues; but there is no chance that you will not spot the killer.